I’m thankful for the internet everyday. I’m thankful when it guides me to a new restaurant, tells me the score of the football game, and provides video of the Ohio University marching band playing their version of a new viral music video “The Fox” by Ylvis. But despite the silly stuff, I was genuinely thankful for the internet this Rosh Hashanah. Trapped in my home due to some semi-serious plumbing problems and a particularly slow moving plumber, I turned to my trusty friend and companion to help me celebrate the holiday. 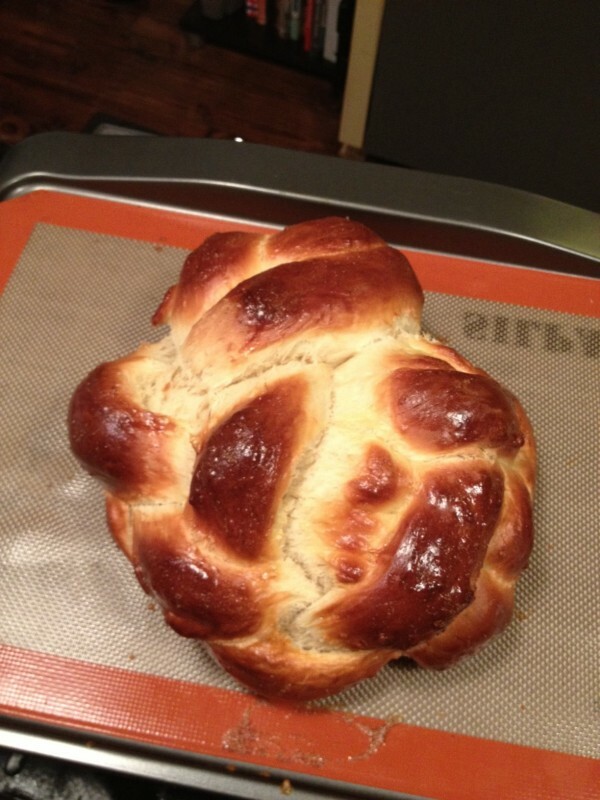 First, this post on Tablet inspired me to get my hands dirty and bake myself a challah. What better way to celebrate the new year than my stuffing my face all day with sweet sweet carbs? Joan Nathan led me through a tricky six part braid and helped me pull off the most beautiful Jewish cooking moment of my life. Next, I met up with Congregation Beth Adam, a congregation out of Loveland, Ohio that leads innovative and inspirational services online each week at OurJewishCommunity.org. Dedicated to the celebration of Jewish holidays and life cycle events, Beth Adam approaches Judaism from a humanistic perspective. I was first introduced to Congregation Beth Adam by Rabbi Laura Baum when she presented at last year’s ISJL Education Conference. She gave us a tour of their synagogue, complete with stained glass windows representing the Big Bang and a ner tamid in the shape of a DNA double helix. I knew they would help distract me from the pipes clanging under my house and get me in the mood for the new year. Rabbi Baum and Rabbi Robert Barr are talented clergy and are magically able to exude warmth and welcoming over the internet. Sweet congregants approached the camera to send good wishes to friends and family watching at home. Besides the fantastic sermons, which really challenge traditional Jewish high holiday liturgy, my favorite part was a chat-bar besides the video stream. Instead of feeling guilty kibitzing with friends in the pews, participants are encouraged to chat simultaneously about the service. I made new friends from all over the world, some with physical disabilities who couldn’t make it to services, some who lived too far way to be there (like me), and others who came specifically for the unique approach of Beth Adam (like me, too!). 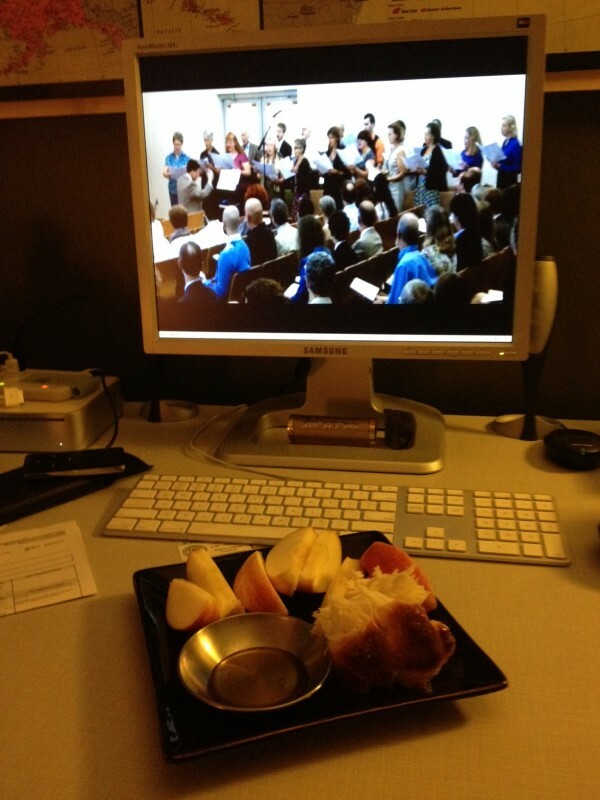 I sat in front of the screen, eating my freshly baked challah, apples, and honey and had a sincere and authentic Rosh Hashanah experience. And after 4 hours of jetting and root cutting, the plumber gave me the clear to use the bathrooms in my own home again. A wonderful sign of good things to come in the new year! What did you do for Rosh Hashanah this year? Would you consider joining an online community for services? Why or why not? Though blondies might not seem quite fancy enough for a big holiday meal, trust me that these will blow your hair back. When you need a break from honey cake. When you break into the round loaf, it is like biting into a challah cinnamon bun.